“Who can I send to the hospital with you?” asked my worried housemate, “Dorni”. I needed to consult a surgeon to see if I needed surgery for appendicitis. I’m in Romania working for Romanian orphans, with Heart to Heart International Ministries (H2H). We work in a hospital for abandoned babies, playing with, feeding, and changing them. And we have transition house teaching trades to boys and girls too old for the orphanage. Dorni wouldn’t send an American to the hospital alone. Navigating language in a foreign hospital is daunting — but she’d promised to babysit her sick niece. I suggested my 24-year-old, brown-haired, blue-eyed friend “Stefania”, who’d translated for H2H for three years, and was working part-time while finishing nursing school. She knew the hospitals, and had a flexible schedule. Stephania immediately agreed to meet me. My visit didn’t turn out as expected! The doctor felt my stomach, asked questions, and declared, “This is acute appendicitis; we’ll operate today!” I was taken aback, having expected nothing more than tests and at worst, scheduling surgery “eventually”. Numb, shaken, and a bit scared, I leaned on Stefania to help figure out what to do. 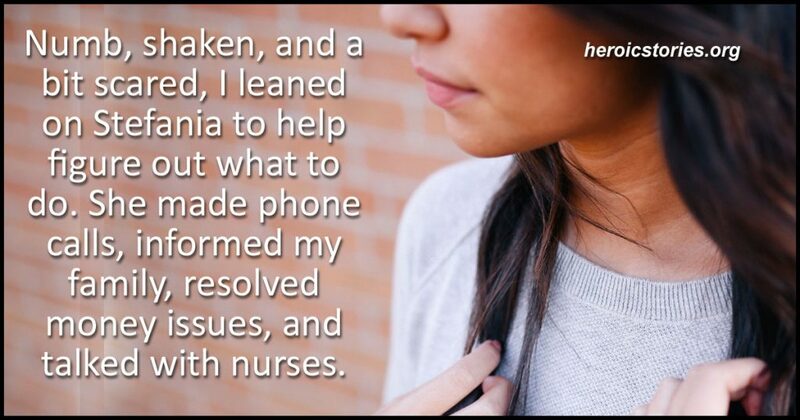 She made phone calls, informed my family, resolved money issues, and talked with nurses. She returned to her nearby home and brought overnight things for us both. She held my hand when I came back from surgery while I tried to recover. That was only the beginning. The next two days Stefania was almost constantly at my side. That first night all I had to do was make eye contact and she came running to see what I needed. She held my head as I threw up (sometimes all over the bed or on her), gave me sips of water and tea — she was always there. She called the nurses for painkillers, and held my hand while I moaned in pain waiting for them to kick in. She helped pick me up so the nurse could change my sheet, pulled my hair back and kissed my forehead. When they said the next day that I could get up and walk, she supported me in my hobbling, held my IV, and smoothed my blankets when I returned. Stefania also jumped right in to help my roommates. She helped them get to the bathroom or to sit up, called nurses for them, and rearranged their pillows. She praised their attempts to walk, poured tea and water, ran errands, and encouraged everyone. The nurses called her for help moving patients, etc. Many people made this experience the best it could be. The doctors and nurses took good care of me and tried to help me feel not so far away from home. During my convalescence my Romanian friends and co-workers called, cooked, visited, and otherwise cared for me, and I am so thankful to them. However, Stefania was in the right place at the right time, and gave in abundance. Stefania is truly an angel in human form. I wish I could be around her for a while, i would suggest any single man who is excellent would be so lucky to have her for his wife.